Rosemary Chicken Breasts | K.I.S.S. We always love a new chicken recipe! And we love to grill. Chicken breasts are one of Brad’s favorites! (That makes things easy.) I always choose all-natural chicken with no added preservatives. In this recipe, we marinated the chicken and then grilled it. It was great! While the chicken was finishing up on the grill, we threw on a few green onions. The onions tasted great while also adding a litte extra color and flavor. In large bowl, combine olive oil, balsamic vinegar, honey, thyme, rosemary, lemon juice and dijon mustard. Add chicken breasts and coat with the marinade mixture. Cover bowl, refrigerate, and let marinate at least 4-6 hours before cooking. When ready to cook, remove chicken from refrigerator and let sit at room temperature. Heat grill to high heat. 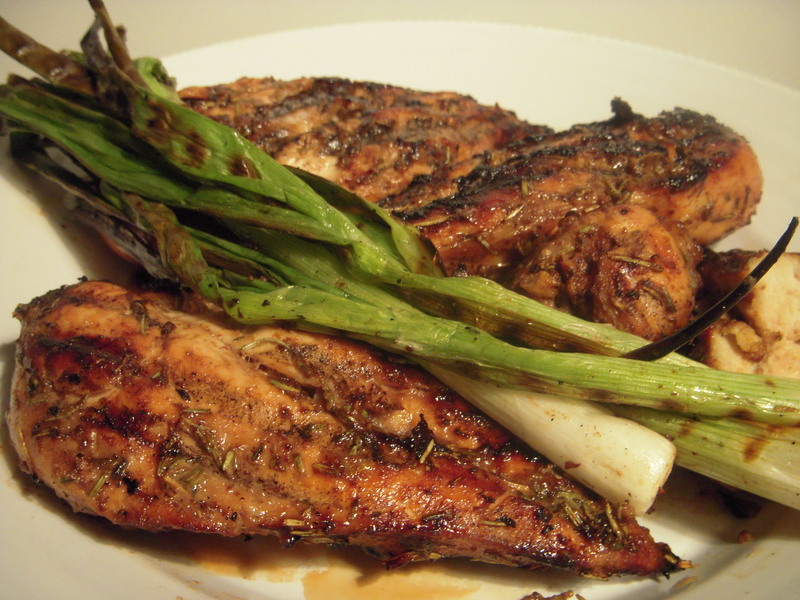 Remove chicken from marinade and cook over direct heat on grill for 10-15 minutes, depending on thickness. Flip breasts and continue grilling for another 10-15 minutes. Remove chicken when cooked thoroughly. I served the chicken breasts with grilled green onions. Just throw the onions on the grill for about 5 minutes, flipping once. The onions add color and a great touch of flavor when served alongside the chicken. HOW LONG TO MARINATE THE CHICKEN PLEASE? Let’s go with 4-6 hours. Thanks!! I love the question! Im gonna add that in now.